The timing of the Williamstown Literary Festival couldn’t have been worse – the same weekend as Clunes Book Town! Tim and I went to Clunes last year and had a splendid time, snaring a first edition of Peter Carey’s Booker prize winning Oscar and Lucinda for a song and vowing to go back year after year because it’s such good fun. Clunes – Victoria’s first gold town, has a wealth of lovely old buildings which are turned into bookstores for the day; there are author talks and wonderful displays of book related memorabilia. Williamstown, however, was offering a chance to hear Steven Conte, author of The Zookeeper’s War and winner of the inaugural Prime Minister’s Literary Award and it was too good to pass up. This is a prestigious award worth a lot of money, and I wanted to hear about what this writer might be planning to do next. The Zookeeper’s War tackled some weighty themes and showed real skill in evoking Berlin during war time, and I was hoping it would not be a ‘one-hit wonder’. I picked up Lurline and we set off for the Williamstown Town Hall bright and early on a lovely Sunday morning. Our first session was with Martin Flanagan, a journalist with The Age and author of a number of books as well. Asked what he thought the great questions of our time might be, he told us about his travels in Western Victoria where he saw the ravages of the drought at first hand. More recently he visited areas devastated by bushfire, and this has convinced him that we are entering a new historical phase, marked by economic and environmental problems which our politicians have as yet failed to comprehend. He thinks that things are grim, but that people are adaptable: things have been grim before – during WW2 for example – yet people rose to the occasion. He reminded us of the abolition of the slave trade. This mighty reform was achieved by a very small number of people refusing to accept injustice. When they began, individuals thought they were alone, in the face of a powerful British Empire whose economy was dependant on the trade in human beings. Undaunted, these individuals had the courage to transform public opinion and change the world. Flanagan talked at some length about the courage of the writer. He said that writing has its own strict morality and that if readers have come to expect the truth from you then truth can’t be abandoned – even in the face of death threats or social opprobrium. Newspapers may have changed as readership has declined, but papers like The Age are what stands between us and the excesses of tabloid journalism. That’s important because journalism is the opposite of ideology: ideology says ‘this is how the world should be’ while journalism tells how it is. I liked his talk very much and found it inspiring. Our second session was a real treat. Susanna Bryson from Victoria University conducted a very good interview, teasing out the journey of two very different first-time writers, Jacinta Halloran (Dissection) and Kate Cole-Adams (Walking to the Moon). Cole-Adams is a journalist who wrote an entire novel before Amanda Lohrey, a wise mentor at Varuna helped her realise that it needed rewriting from scratch. Halloran is a GP who was exploring a possible career move, studying professional writing at RMIT almost as a hobby. Both these authors found it very encouraging to be shortlisted for the 2006 Victorian Premier’s Award for an unpublished work, and have gone on to great success. Lurline and I had already read and enjoyed Dissection, and (partly on the strength of Cole-Adam’s reading of a couple of pages) did not hesitate to hit the bookstall for a copy of Walking to the Moon. We then adjourned to the Mechanics Institute in Electra St where we enjoyed a pleasant lunch in the mild autumn sunshine, and discovered another book stall requiring perusal! And then, Steve n Conte. It turned out to be a remarkable presentation. His topic was ‘Plodding: the writer and the street’ and he shared with us some fascinating snippets from his writer’s notebook, including the one outlining his idea for The Zookeeper’s War. He is a very observant writer, milking observations from his travels for odd little incidents and atmospheric descriptions of place and time. He is a flaneur of sorts, watching what happens, and it’s how he experienced Berlin as a 20 year old, before the fall of the Berlin Wall. Berlin, he says, was at that time a place of melancholy and menace. Wherever one walked, one bumped into the encircling wall. He drew only half-joking parallels with being in a boys’ boarding school to being in a totalitarian state, suggesting that there was a similar sense of confinement, curtailment, group thought and surveillance. In contrast to the constraining spaces of Europe, Australians share a sense of vast space, but boarding school meant having to solve problems in a confined space. These ideas come through sharply in The Zookeeper’s War, especially as bomb damage takes Axel and Vera to ever smaller living spaces. His book was thoroughly researched. He read The Fall of Berlin by Antony Beevor; memoirs of foreigners living in Berlin during the war; anti Nazi memoirs; political, military and social histories; and of course, about zoo-keeping. With the experience of his first novel behind him he now intends to write a full first draft before undertaking extensive research because of the risk of over-doing the research. He’d like to be a full-time writer, and so ten years between books is not really an option. I was interested to hear that he was mentored by Andrea Goldsmith, whose new book Reunion, has just been published. I’m looking forward to reading it! 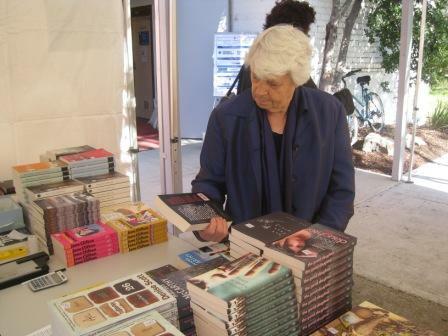 Looks great Lisa…I must get to more Writers’ festivals/events. Martin Flanagan – that’s Richard’s brother isn’t it. I’ve heard of him but not read him – articles or books. In fact, I’ve not read any of the authors you mention here, except Andrea Goldsmith (Modern Interiors, was the title I think) and Peter Carey of course. Yes, Martin is Richard’s brother – different kind of guy, shaggier and more weather-beaten, maybe because he’s more of a journalist? I don’t think I’ve read any of his stuff either because he writes sports columns and all his books are sport related although he includes political comment in them too. There’s the Melbourne Writers Festival in August, but I must say that I particularly liked this Williamstown one because of the focus on literary fiction.